Kansas forward Perry Ellis was one of the most recognizable faces in college basketball last season, no doubt partially because the senior All-American resembled a Jayhawk from the Danny Manning era rather than the one-and-done era. Making the most of his last three years in college, Ellis terrorized the Big 12, averaging better than 13 points per game each season as Kansas amassed three more conference titles. By the end of his collegiate career, he had become the focal point of Bill Self’s offensive attack — using 25.5 percent of the team’s possessions — as a triple-threat power forward who could work the low blocks, attack defenders off the dribble, and knock down outside shots. 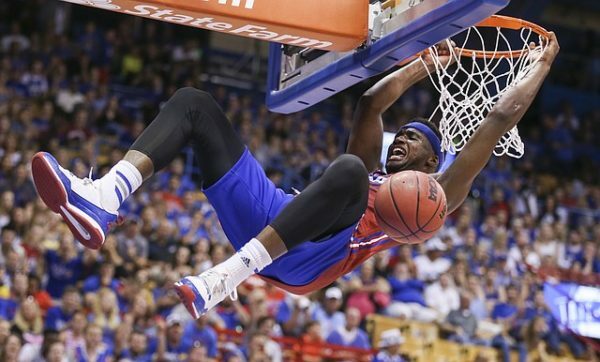 The Jayhawks will now have to find a way to replace Ellis’ production, and that weight is likely to fall heavily on the wide shoulders of sophomore Carlton Bragg. Bragg, a former five-star recruit from Cleveland, Ohio, averaged just 3.8 points and 2.5 rebounds in 8.9 minutes per game as a freshman (he was Self’s fourth-most played big man). Still, the 20-year old flashed sneaky bits of potential. His per 40 minute numbers (17.0 points and 11.1 rebounds) suggest that his per game numbers should dramatically improve with more time on the court. That should get Kansas fans excited about the role he may play this season, particularly as a pick-and-pop big man. Bragg converted 43.6 percent of his two-point jump shots last season, according to hoop-math, and although he has not yet proven to be a consistent outside shooter — attempting just seven triples last year — there are signs that his range could extend that far. Of note is that he knocked down a pair of threes during the Jayhawks’ Late Night in the Phog event earlier this month. The 6’10” forward should also be able to match Ellis’ productivity in the post. Bragg is 25 pounds heavier than he was a year ago and looked noticeably bigger during the Late Night event. That added strength should prove valuable as he is forced into a higher usage role that will include battling with Big 12 bodies on the block for longer stretches of time. It’s too soon to think that Bragg can replicate the full repertoire of Ellis, a wily veteran with an old man’s game that would make your grandpa jealous. The sophomore doesn’t yet have the same ability to attack defenders off the dribble nor does he possess the same collection of crafty post moves. Still, Bragg will be the clear beneficiary of playing on a well-rounded team that features one of the top backcourts in college basketball. That should be enough to lessen some of the burden on the Cleveland native, but Self’s reliance on post play will mean that Bragg (much like Ellis as a sophomore) will be expected to contribute heavily in his second season. By nearly all verifiable accounts, he will be ready. This entry was posted on Thursday, October 13th, 2016 at 2:04 pm by Chris Stone	and is filed under big 12, feature, microsites. Tagged: bill self, carlton bragg, kansas, perry ellis. You can follow any responses to this entry through the RSS 2.0 feed. You can leave a response, or trackback from your own site.